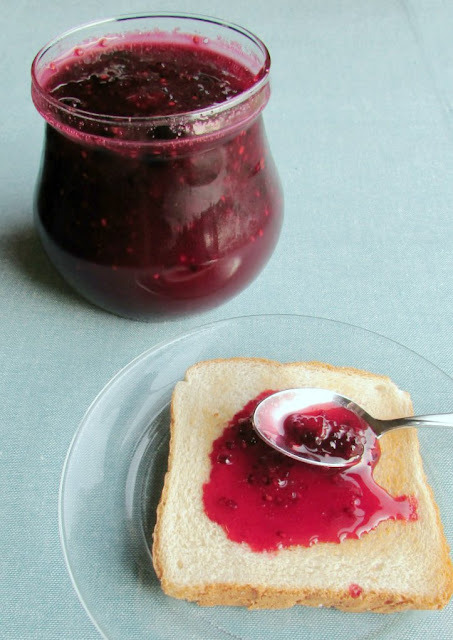 This blackberry spread is quick and easy. It is great over toast, biscuits, pancakes or ice cream! As much as I love the flavors of fall, sometimes I just long for a fresh pop of berries. That is why I always freeze the lion's share of our homegrown blackberries to enjoy during the colder months. 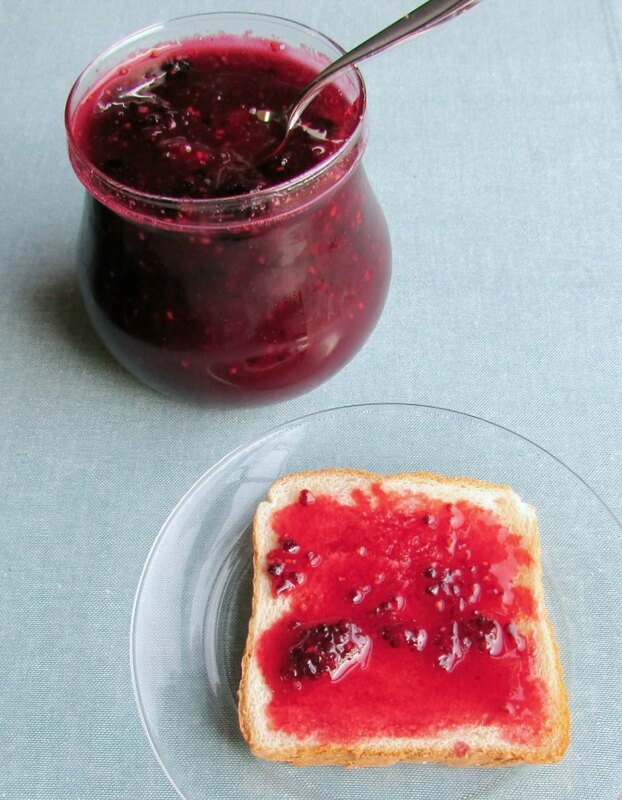 There is nothing better than a fresh berry sauce, spread or jam to put a smile on your face. I am calling this a spread, because it is not quite the consistency of a jelly. Most berry jellies and jams use pectin to thicken them up. I almost never have pectin on hand and when I get something in my head, I just have to make it. So, I will use whatever I have on hand instead. A bit of cornstarch and a little lemon juice come together to make this a perfect spread for your toast or biscuit. If you have waffles, go ahead and warm a bit up and put it on top! It would also be great over some yummy vanilla ice cream. In a large heavy bottomed saucepan, stir together sugar and cornstarch until well mixed. Toss in berries. Mash them a bit with your spatula or a potato masher. If desired, you can use an immersion blender at this stage to make the spread smoother. I chose to leave mine chunky this time. Stir in lemon juice and spoon into clean jars. Refrigerate until ready to use. Store in refrigerator. My husband's favorite berry is the blackberry and oh how he loves his jams, jellies and spreads. I have never made any homemade before but this looks so easy!! Look at sweet lil man scooping the sugar!! 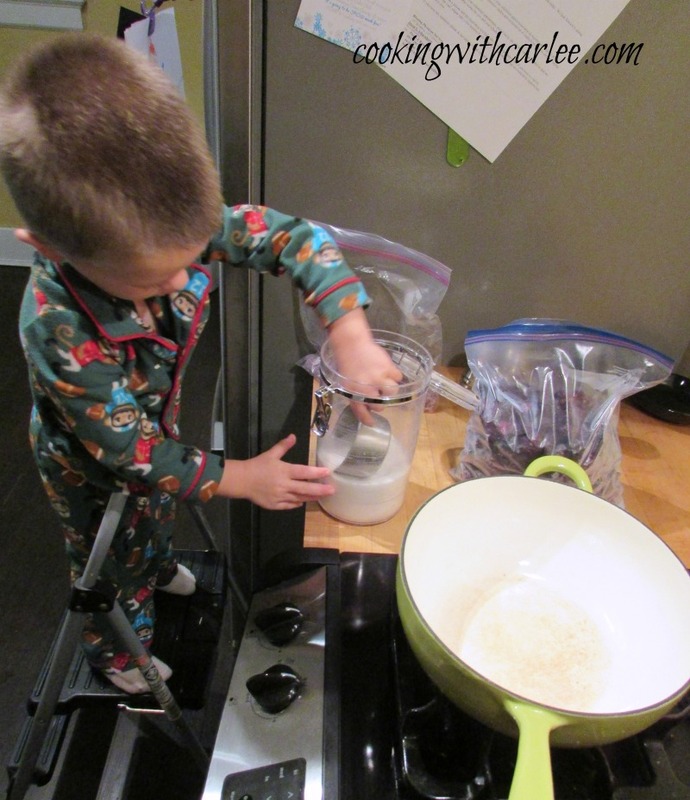 He loves to help and these kind of recipes where you don't have to be super precise are good times for him to measure and pour! I made a spiced peach jam today that I can't wait to share too!! Hi Carlee, I have never made any kind of jelly, jam, or spread before! I love blackberries and I'll have to try this one out. Thanks for the recipe. Thank, Julie! I always love seeing your projects too! I always bake at least one pie or cobbler when they are fresh from the patch, but I love cooking with them during the fall and winter! Thank you! I love blackberries and now I'm craving them-- I'm going to have to try this! It's like having blackberry pie filling on your morning toast! I'm like you Carlee! I have to, have to, HAVE to have fruit year round so I use a lot of frozen fruit. There's nothing like that pop in the middle of a dreary winter! It just brightens up a cold day, doesn't it? We love blackberries! Yum! Thanks for sharing at our Tips & Tricks link party. 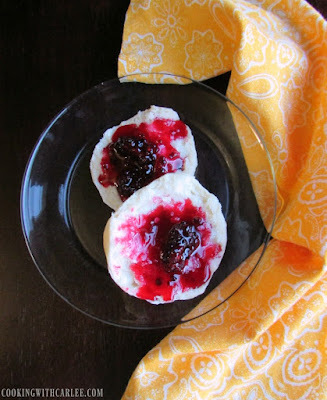 I think you adorable helper will make this Blackberry spread very special, it looks awesome and thanks so much for sharing with Full Plate Thursday. Hope you had a great week and come back soon! I do have the best kitchen help around, that is for sure! Thanks, Miz Helen! Nothing better than pulling a bag of frozen berries out of the freezer and making something this delicious! Carlee, this looks so delicious. You know I love a Berry sauce over my pancakes or waffles. This is such a great way to top a loaf of homemade bread or a muffin. And I love blackberries. Recently I found a frozen yogurt with a blackberry sauce Frozen in ribbons through the entire carton. It was so good. I bet I could make your sauce and whip up some of my own ice cream. Thanks for sharing your recipe it looks so delicious. Oooh, that ice cream sounds wonderful! Now I really want to try that. Jax and I are on our own for dinner tonight, so I think waffles with blackberries are in store! Have a wonderful weekend, Nikki! Hi Carlee, this is so simple and I rather like a runny consistency for a spread as the flavour soaks in. I bet it would work well with other berries too. I do too, especially on an English muffin or biscuit or something! Thanks, Debbie!